The Shenyang J-11 (Chinese: 歼-11), with NATO reporting name Flanker-L, is a twin-engine jet fighter, whose airframe is based on the Soviet-designed Sukhoi Su-27 air superiority fighter. It is currently manufactured by the Shenyang Aircraft Corporation. The aircraft is operated by the People's Liberation Army Air Force (PLAAF) and People's Liberation Army Naval Air Force (PLANAF) of China (PRC). A Shenyang J-11 flies over Anshan Airfield in March 2007. In the 1970s, Shenyang Aircraft Factory proposed a new designed light fighter powered by the British Rolls-Royce Spey 512 engine, with better maneuverability than MiG-19 then in service and better climb rate than MiG-21. Known as the J-11, the project was abandoned due to difficulties in obtaining the engines. The J-11 was finally born in 1998 as a Chinese version of the Soviet-designed Sukhoi Su-27SK air superiority fighter after China secured a $US2.5 billion production agreement which licensed China to build 200 Su-27SK aircraft using Russian-supplied kits. Under the terms of the agreement, these aircraft would be outfitted with Russian avionics, radars and engines. However, in 2004, Russian media reported that Shenyang co-production of the basic J-11 was halted after around 100 examples were built. The PLAAF later revealed a mock-up of an upgraded multi-role version of the J-11 in mid-2002. 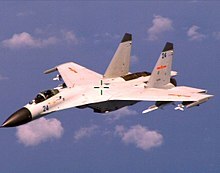 The indigenous J-11B variant incorporates various Chinese material modifications and upgrades to the airframe with improved manufacturing methods in addition to the inclusion of domestic Chinese technologies such as radar, avionics suites and weaponry, including anti-ship and PL-12 air-to-air missiles presumably for the role of a maritime strike aircraft. The alleged reason for the sudden stop in the production line of the J-11 was because it could no longer satisfy the PLAAF's requirements, due to elements such as the obsolete avionics and radar, which were structured for aerial missions. The J-11/J-11B's legitimacy remains unproven, despite a wealth of information coming to light since 2007. In the course of a press conference at the 2009 Farnborough Airshow, Alexander Fomin, Deputy Director of Russia's Federal Service for Military-Technical Co-operation, reported that Russia had not so far tabled any questions to China with regard to "copying" military equipment. Fomin reported that Russia handed China the licences to manufacture the aircraft and its components, including an agreement on the production of intellectual property rights. Details of intellectual property rights, however have not been disclosed, fuelling speculation about a "secret" contract or parts of the original contract. The licence, at least officially, did not include an aircraft carrier version- Sukhoi Su-33 nor any variant of it, such as the Shenyang J-15. At the MAKS 2009, Rosoboronexport's General Manager Anatoli Isaykin was quoted saying: "Russia is going to investigate the J-11B, as a Chinese copy of the Su-27 and Sukhoi Company is partaking in the process." In 2010, Rosoboronexport announced via their official website that it was in talks with the Chinese side, regarding the ongoing production of weapons that Russia considers as un-licensed. In light of the ongoing investigations, Rosoboronexport expressed its concern over future sales of advanced Russian systems and components to China. At the Zhuhai 2002 airshow, a photo was released allegedly depicting a J-11 modified for flight testing of a single WS-10 Taihang turbofan. Andrei Chang, a military specialist on China reported that one J-11A was outfitted with the indigenously produced WS-10A turbofan engine, J-11B also uses WS-10A. However, Russian media reports also indicate that China still intends to upgrade the current J-11 fleet's engines with either Saturn-Lyulka or Salyut powerplants. Engines under consideration include the Saturn AL-31-117S (a development of the Lyulka AL-31F planned for the Russo-Indian Su-30MKIs), and the Salyut AL-31F-M1, an improved variant of the AL-31F engine. In 2002, Russian media reported that Shenyang Aircraft Corporation was looking into replacing Russian-made J-11/Su-27SK components with domestic, Chinese-made parts. Specifically, to replace the Russian-made NIIP N001 radar with a Chinese-made fire control radar based on the Type 147X/KLJ-X family, the AL-31F engine with WS-10A, and Russian R-77 AAM's with Chinese-made PL-9 and PL-12 AAM's. One J-11 was photographed with an AL-31F and a WS-10A engine installed for testing in 2002. However, it was not until 2007 when the Chinese government finally revealed information on the domestic J-11: the J-11 used to test WS-10 was designated as J-11WS, and it was when state television station CCTV-7 aired J-11B footages in mid-2007 when the existence of J-11 with domestic components was finally confirmed officially. Serial manufacturing of the WS-10 and integration with the J-11, proved to be more difficult than expected. As a result, even though several related prototypes had been tested and at least one regiment converted to the Taihang powered J-11B version in 2007, these aircraft were later grounded for an extended period due to a poor operational reliability. A report in the Washington Times suggested that the Chinese engines lasted 30 hours before they needed servicing, compared to 400 hours for the Russian versions. Defects were traced back to the engine manufacturer, Shenyang Liming Aircraft Engine Company employing sub-standard manufacturing and quality control procedures. Several subsequent batches temporarily reverted to the original, Russian AL-31F turbofans. The engines manufacturing problems had finally been solved by the end of 2009 and the WS-10A had reportedly proved mature enough to power the Block 02 aircraft. In March 2011 a joint Sino-Pakistani exercise, Shaheen 1, was conducted at a Pakistan Air Force (PAF) base involving a contingent of Chinese aircraft and personnel from the PLAAF. Information on which aircraft were used by each side in the exercise was not released, but photos of Pakistani pilots inspecting what appeared to be Chinese Shenyang J-11B fighters were released on the internet. The exercise lasted for around 4 weeks and was the first time the PLAAF had deployed to and conducted "operational" aerial maneuvers in Pakistan with the PAF. Chinese Shenyang J-11B fighter intercepting an American P-8. The photo was taken by the crew of the P-8. Underside view of the J-11BH, showing its air-to-air complement of two PL-8 and two PL-12 missiles. In response, the Chinese Ministry of National Defense spokesman Yang Yujun said that the relevant criticism made by the U.S. side was "totally groundless," as the Chinese pilot, with professional operation, kept the jet within a safe distance from the U.S. aircraft. He also said it was the U.S. massive and frequent close-in surveillance of China that endangered the two sides' air and marine security, and was the root of accidents. He added that China urged the U.S. side to abide by international law and international practice, respect concerns of the coastal countries, and properly deal with the differences between the two sides on air and marine security issues. J-11A – Chinese/Russian assembled Su-27SK from Russian-made kits. 104 were built. They were later upgraded with MAWS. Unconfirmed upgrades include improved cockpit displays, and fire control systems for R-77 or PL-10 missiles. It is also called J-11. J-11BS – A twin-seat version of the J-11B. In 2012, the number of J-11B and J-11BS in service was over 120. J-11BH – Naval version of the J-11B. It was first sighted in May 2010. J-11BSH – Naval version of the J-11BS. J-15 – Carrier-based version based on the J-11B, incorporating structural elements from the Sukhoi Su-33 prototype purchased from Ukraine in 2001. It uses avionics from the J-11B. J-16 – Twin-seat strike fighter based on Russian Sukhoi Su-30MKK sold to China in 2000. It is claimed to be a variant of the J-11BS. J-11D – Variant with fixed electronically scanned array radar, IRST, and capability to fire heavier imaging/infrared (IIR) air-to-air missiles. The airframe makes greater use of composite materials, especially in the engine intakes for lower radar observability. The wings have three hardpoints each. Unconfirmed reports claim it has a new fly-by-wire control system, glass cockpit, improved EW systems, and an improved version of the WS-10A engine. Fire-control radar: NIIP Tikhomirov N001VE Myech coherent pulse Doppler radar. J-11B to be equipped with AESA radar. ^ Collins, Jack. 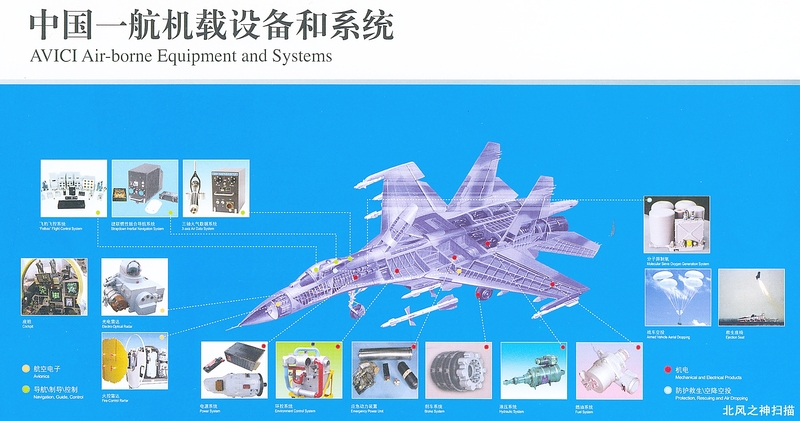 "Chinese Fighter Development". China-defence.com. Archived from the original on 2007-01-16. Retrieved 2007-01-16. ^ a b "China copies Su-27 fighter, may compete with Russia – paper". RIA Novosti. ^ "Chinese version of Russian jet endangers bilateral relations". Rt.com. Archived from the original on 2012-06-30. Retrieved 2011-05-12. ^ "Chinese Aircraft – J-11 (Sukhoi Su-27)". Globalsecurity.org. ^ SIPRI Yearbook 2009:Armaments, Disarmament, and International Security. Stockholm International Peace Research Institute. 2009-09-15. ISBN 978-0-19-956606-8. ^ "J-11A cockpit". Archived from the original on 2011-06-11. Retrieved 2011-05-12. ^ a b Andreas Rupprecht. December 2011. "China's 'Flanker' gains momentum. Shenyang J-11 update". Combat Aircraft Monthly. Vol. 12, No. 12, p. 40–42. ^ "Lenta.ru: "Рособоронэкспорт" пообещал разобраться с китайскими копиями Су-27". Retrieved 4 February 2015. ^ obsessed. "МАКС 2011". Retrieved 4 February 2015. ^ Richard D. Fisher, Jr. (2003-10-07). "New developments in Russia-China Military Relations". United States-China Economic and Security Review Commission. Archived from the original on 2007-03-01. Retrieved 2007-01-16. ^ "Su-27 Modernisation Programme". Sinodefence. 2006-11-30. Archived from the original on 2007-01-11. Retrieved 2007-01-16. ^ Pomfret, John (25 December 2010). "Military strength eludes China, which looks overseas for arms". Washington Post. ^ "Pak Air force conducts joint exercise with China". Times of India. Mar 19, 2011. Retrieved 23 May 2011. ^ Zambelis, Chris (May 20, 2011). ""Shaheen 1" Exercise Signals Expansion of China-Pakistan Alliance". China Brief Volume: 11 Issue: 9. The Jamestown Foundation. Retrieved 23 May 2011. ^ a b Capaccio and Greiling Keane, Tony and Angela (August 22, 2014). "Chinese Jet Barrel-Rolls Over U.S. Plane Bringing Protest". Bloomberg L.P.
^ a b Keck, Zachary (August 23, 2014). "China's 'Dangerous Intercept' of US Spy Plane". The Diplomat. ^ Zachary Keck, The Diplomat. "China's 'Dangerous Intercept' of US Spy Plane". The Diplomat. Retrieved 4 February 2015. ^ "Defense.gov Transcript: Department of Defense Press Briefing by Admiral Kirby in the Pentagon Briefing Room". Retrieved 4 February 2015. ^ "China urges U.S. to stop close-in surveillance". Xinhua. 23 August 2014. Archived from the original on 23 August 2014. Retrieved 8 March 2015. ^ a b c d Fisher, Richard D., jr. (11 March 2015). "Images suggest upgrades to China's early series J-11s". IHS Jane's 360. Archived from the original on 2015-12-22. Retrieved 17 December 2015. ^ Wong, Kelvin (12 November 2014). "Airshow China 2014: AVIC unveils FC-31 export fighter concept". IHS Jane's 360. Retrieved 17 December 2015. ^ Fisher, Richard D. Jr. (4 September 2015). "China showcases new weapon systems at 3 September parade". IHS Jane's 360. Retrieved 18 December 2015. ^ a b c d e f Parsons, Ted (10 May 2010). "Chinese naval J-11s spotted in the open". IHS Jane's 360. Archived from the original on 11 May 2010. Retrieved 18 December 2015. ^ Kopp, Carlo (27 January 2014). "Shenyang J-11B/BH/BS/BSH Flanker B/C+". ausairpower.net. Retrieved 19 December 2015. ^ Richard D. Fisher, Jr. (2012-03-19). "China Modernizes Air Force On Dual Tracks". Aviation Week & Space Technology. Archived from the original on 2013-05-12. Retrieved 2012-07-10. ^ a b Yeo, Mike (2 November 2015). "PLAN holds snap drills in South China Sea". IHS Jane's 360. Archived from the original on 2015-12-22. Retrieved 17 December 2015. ^ "Can China Enforce a South China Sea ADIZ?". usni.org. 18 July 2016. Retrieved 2 February 2019. ^ Fulghum, David A. (27 April 2011). "New Chinese Ship-Based Heavy Fighter Readied For Flight Tests". Aviation Week Network. Retrieved 17 December 2015. ^ "Chinese Counterfeiters Nail Another Russian Jet Fighter". strategypage.com. Retrieved 6 April 2015. ^ John Pike. "J-16 (Jianjiji-16 Fighter aircraft 16) / F-16". Retrieved 4 February 2015. ^ Air Power Australia (2014-01-27). "PLA-AF and PLA-N Flanker Variants". Ausairpower.net. Retrieved 2019-02-02. ^ Fisher, Richard D., jr. (5 May 2015). "Images show J-11D variant with possible new radar". IHS Jane's 360. Retrieved 17 December 2015. ^ "Su-27 Specifications". Sinodefence.com. 2006-11-04. Archived from the original on 2012-01-12. Retrieved 2007-01-16. ^ Sukhoi Su-27SK Archived 2013-09-20 at the Wayback Machine. KNAAPO. ^ "Sukhoi Company (JSC) – Airplanes – Military Aircraft – Su-27SК – Aircraft performance". Sukhoi.org. Archived from the original on 2011-07-16. Retrieved 2011-05-12. ^ "Sukhoi Su-27 Flanker Specifications". Sinodefence.com. Archived from the original on 2010-01-13. Retrieved 2011-12-22. ^ Originally measured as 7,600 kgf. ^ Originally measured as 12,500 kgf. ^ "Chinese Aircraft - J-11 [Su-27 FLANKER]". www.globalsecurity.org. Retrieved 2 February 2019. ^ "Sukhoi Su-27 Flanker". Fighter-planes.com. Retrieved 2011-05-12. ^ "Sukhoi Company (JSC) – Airplanes – Military Aircraft – Su-27SÊ – Aircraft performance". Archived from the original on 16 July 2011. Retrieved 4 February 2015. Golan, John (2006). "China's Hidden Power: The First Half Century of PLAAF Fighter Aviation". Combat Aircraft. 7. Wei, Bai (2012). "A Flanker by any other name". Air Forces Monthly. 5. Wikimedia Commons has media related to Shenyang J-11.